59° N, 109° W; Mapsheet 74 N. The Athabasca Sand Dunes are a unique geological feature located in northwest Saskatchewan on the south shore of Lake Athabasca. The region of dunes stretches for 100 km in a narrow strip along Lake Athabasca from the Alberta border east to Richards Lake. The dunes reach heights of 30 metres and vary in length from 400 to 1,500 metres. The Athabasca Sand Dunes comprise the largest area of active sand dunes in North America, and are the most northerly active dunes in the world. The dunes were formed roughly 8,000 years ago during the last glacial period. When the ice-sheet retreated from the area, meltwater channels and spillways (such as the valleys of the present-day William and MacFarlane rivers) washed great volumes of sand and sediment into Glacial Lake Athabasca. As the lake receded, these deposits were exposed and through years of wind action have been shaped into the spectacular and expansive dune formations of today. Considerable portions of the Athabasca Sand Dunes are unstable: the dunes gradually move with the prevailing wind direction and encroach on the adjacent forest. Within the Athabasca Sand Dunes region, a variety of depositional and glacial landforms can be found including braided river channels, beach ridges, inland river deltas, desert pavement, moraines, eskers, and kettle lakes. The ecology of the region is unique and varied. It supports as many as seventy rare plant species, ten of which are endemic (i.e., found nowhere else in the world). Active dunes have been colonized by field chickweed (Cerastium arvense), felt-leaved willow (Salix silicicola), Mackenzie hairgrass (Deschampsia mackenzieana), Tyrrell’s willow (Salix planifolia ssp tyrrellii), and fluccose tansy (anacetum huronense var. floccosum)—all endemic species—in addition to common grasses and fescues. Habitat on stabilized dunes is characterized by low shrubs, herbs, and grasses interspersed with open sand patches and stands of jack pine. In 1973, the Saskatchewan government protected the Athabasca Sand Dunes as a Crown Reserve. In 1992, after nearly two decades of consultation, the Reserve was given Provincial Park status. 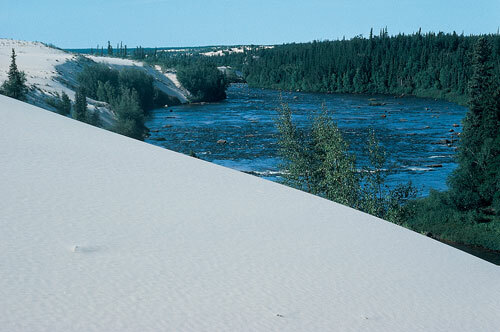 The Athabasca Sand Dunes Provincial Wilderness Park encompasses 1,925 square kilometres, and is deemed by Parks Canada to be one of the most significant natural areas in the country. Although the park has no road access, services, or communities, guided interpretative trips are available into the park to explore the dunes on foot or by boat. Karpan, R., and A. Karpan. 1998. Northern Sandscapes - Exploring Saskatchewan's Athabasca Sand Dunes. Saskatoon: Parkland Publishing; Saskatchewan Environment and Resource Management.1998. The Ecoregions of Saskatchewan. Regina: Canadian Plains Research Center.